MEGabite #24 or 78 on my countdown. Crabcake with dill sauce at Our Place Cafe in Wetumpka, Alabama. With a population of about 6,528 (2010 census.) It is one of those beautiful small towns that one might think only exist in a painting. Known as ‘The City of Natural Beauty,” A river flows through the town,lots of interesting architecture and churches of days gone by. Once a cotton boom town, it is the kind of place where you wonder, who lived here? What was the long ago success story? Located in a renovated old general store, I expected a small town café, and was blown away by the interesting atmosphere and nice menu. This dish is described as sweet lump crabmeat, lightly browned in olive oil with a light golden brown crust, served with their special cold, creamy dill sauce. On my visit, the side dish was local grown fresh green beans and a baked potato. ** for the crabcake dish served with fresh local green beans. *1/2 for an interesting atmosphere, a great menu, local green beans cooked perfectly. 1/2 * even though it was very busy, the staff were kind and showed pride in their establishment. I admire that. This dish cost $20.00. I felt the crab cakes were small for that price point, and as you can see, the sauce was there but was extremely sparse. It was a busy night and the restaurant was full. The service was a bit off; slow, food came out of order and only a speck of dill sauce on my crab cakes, but our server was sincerely apologetic. We all know that this happens sometimes. I am not crabbin about it, simply explaining my experience. I would certainly visit again and try out some of the other interesting dishes on the menu. My last visit was a year ago. I had a seafood special that was delicious and experienced excellent service. Try the fried green tomatoes. Yum! While in Wetumpka, Check out the meteor crater that is nearly 5 miles wide from 83 million years ago. Float the river by canoe or kayak at nearby at Coosa River Adventures. Love crabcake? 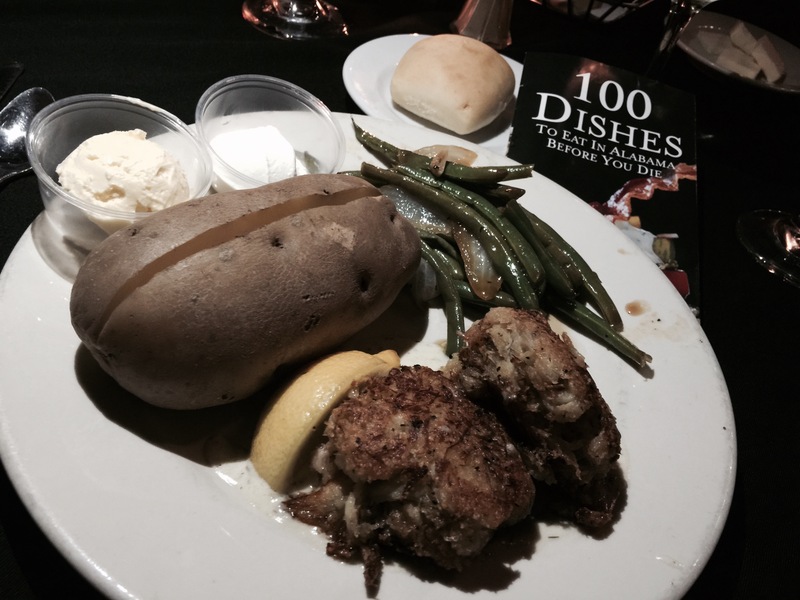 Check out the cookbook “I Love Crabcakes” 50 Recipes For An American Classic by Tom Douglas. Chef Douglas has gathered recipes from a global community. You will never look at crabcakes the same again. I use a 5 MEGastar system. I am not a food critic, just Meg, a curious traveler, with an interest in trying different foods and sharing my two cents on this experience. I try to follow my star system so that I may be fair to the wonderful dishes on this list.